This is a pbr road textures pack consists of 3 pbr road texture sets. Each has 2 versions, clean and cracked. 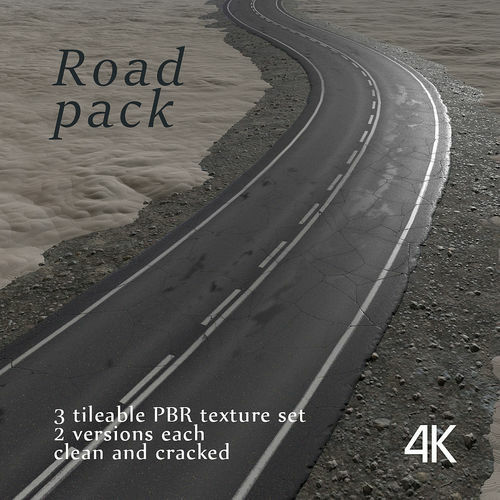 The pbr road textures pack is 4k carefully made high quality tileable, seamless tileable texture set ready to apply to your materials to add more realism and artistic look to your scenes in any host application. The road texture sets consist of basecolor, normal, roughness, height maps. Preview image was rendered in 3dsmax 2014. This scene is included as a bonus. Thank you too. Really appreciated!